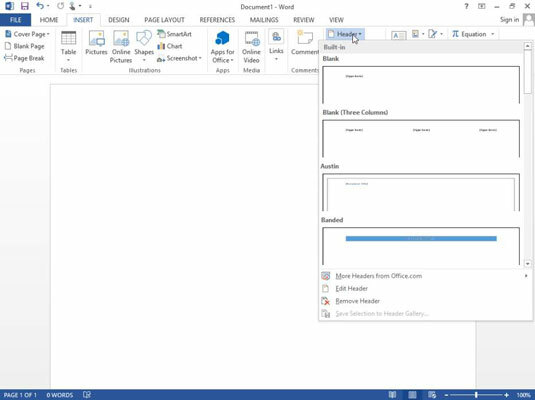 All Office 2013 applications, including Word 2013, have a common system of navigation called the Ribbon, which is a tabbed bar across the top of the application window. Each tab is like a page of buttons. You click different tabs to access different sets of buttons and features. If Word isn’t already open from the preceding exercise, open it. Press Esc or click Blank document to start a new document. New in Word 2013, a Start screen appears when you start the application. To bypass it and go to a new blank document, you can press Esc or click one of the templates that appears (such as Blank document). Buttons for inserting various types of content appear. The buttons are organized into groups; the group names appear at the bottom. For example, the Pages group is the leftmost group. In the Symbols group, hover the mouse pointer over the Equation button. A ScreenTip appears, telling you the button’s name and purpose and showing a keyboard shortcut (Alt+=) that you can optionally use to select that command. The Equation Tools Design tab is an example of a contextual tab. Contextual tabs appear only in certain contexts, such as when a particular type of object is active — in this case, an equation box. 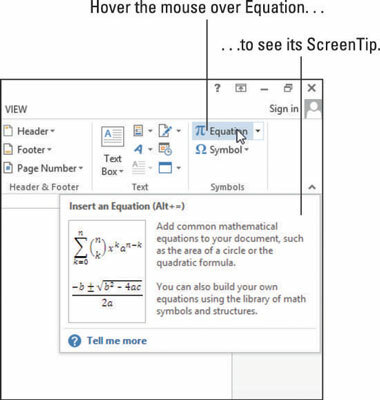 Press Delete to remove the equation box. Click the Insert tab again, and in the Header & Footer group, click the Header button. You can tell the Header button opens a menu because the button has a down-pointing arrow on it. Click away from the menu to close it without making a selection. In the Illustrations group, click SmartArt. 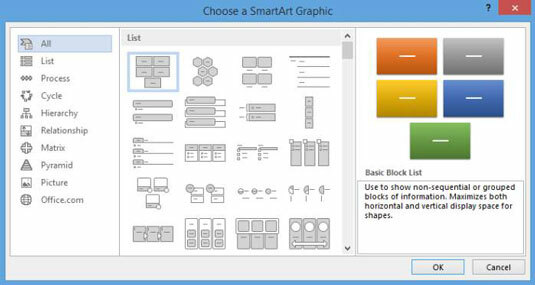 The Choose a SmartArt Graphic dialog box opens. Click Cancel to close the dialog box without creating a graphic. Click the Home tab, and in the Font group, click the Bold button. The Bold attribute is toggled on. Your first name appears in bold. Click the Bold button again. The Bold attribute is toggled off. Press the space bar, and then type your last name. Your last name does not appear in bold. In the Paragraph group, notice that the Align Left button is selected. Click the Center button in the Paragraph group. Your name is centered horizontally on the page. The Align Left, Center, Align Right, and Justify buttons operate as a set to select horizontal alignment. Note: The paragraph alignment buttons are a set; when you select one, the previously selected button is deselected. The last action is undone, and the paragraph alignment goes back to left alignment. Click the dialog box launcher button in the bottom-right corner of the Paragraph group. A Paragraph dialog box opens. Click Cancel to close the Paragraph dialog box. If the Word window is maximized, click the Restore button in the upper-right corner so that the window is resizable. Note the buttons available in the Editing group on the Home tab. 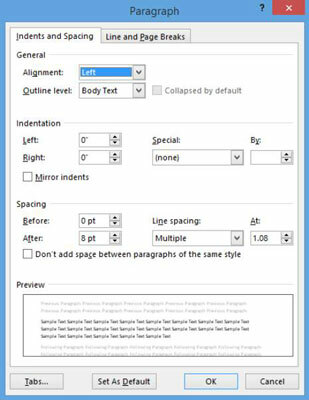 Drag the right border of the Word window toward the left, decreasing the size of the Word window until the Editing group collapses into a single large button. The menu that opens contains the buttons that were previously available from the Editing group. 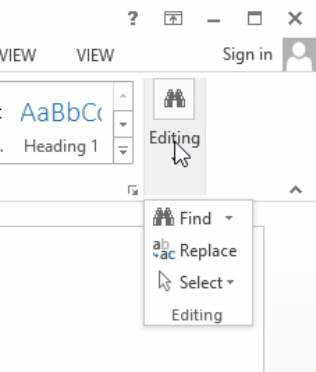 Drag the right border of the Word window toward the right until the Editing group is expanded again. Click the Maximize button (second of the three buttons in the window’s upper right corner) if you want to maximize the window.